This is an Official Whitman Coin Folder for the Lincoln Cents Collection Dated 1941 - 1974 (Volume Two). Retail $4.99 SAVE 23% ! I have several of these and they are great coin books. I did not purchase any from Hobbylinc, yet, but figured I&apos;d review them since I have had them for a while. Fun to fill and not really that hard or expensive to do. They are cheaper here than what I paid for them at a hobby shop. 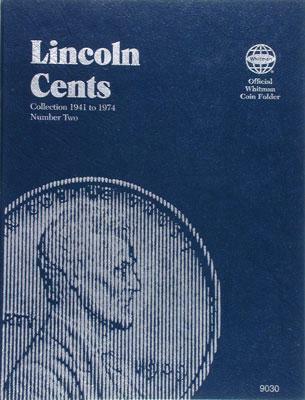 This book allows you to store and display Lincoln cents dated 1941 through 1974 inclusive. This is a sturdy dark blue, three panel thick cardboard folder. This folder will hold 90 pennies. Each coin slot is dated and mint marked according to which mint the coin was struck from. Quantity minted for each particular coin is printed below slot. The holes in this folder have a special, positive lock-in feature. History regarding this type of coin is printed on the inside cover. Great gift idea for the coin collector in your life!